EEE! I went to the workshop today and one of the ladies had bought a doll in she made over the week. 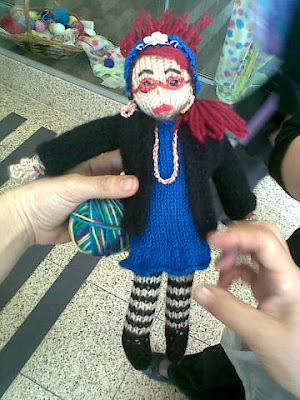 She’s made a doll of her art teacher as a gift for her. How great is that? It’s so personalized, from the stockings to the glasses to the jewellery to the hair and hair wrap. Oh, I was so thrilled she made this! I’m so happy. In related news, the workshops will run until the end of the year now. We’re looking at other craft to teach the ladies, machine sewn sofites seem to be the front runner at the moment. 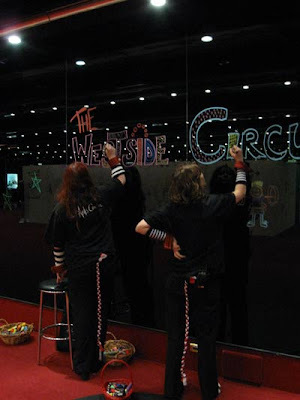 And here are some of the Front of House staff wearing their uniform, also drawing on the wall. 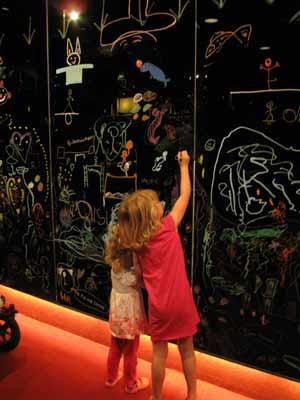 EVERYONE wanted a go, when else are you not only allowed but actively encouraged to draw all over the arts centre? 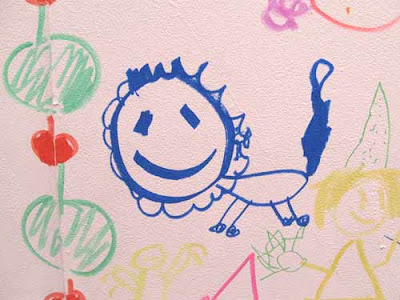 There were SO many awesome drawings over the 5 days, but below is my favourite, a smiley lion. I even considered getting it tattooed, I am so taken with it. But I thought better of it. But there’s just something so amazing about it. It was an incredibly tiring week, but packed full of fun and I loved it. Thank you! I had a ball, but I was a zombie by the end. Children are endlessly energetic! oh the knit teacher is fantastic. how great are all the drawings on the wall? my totem fellow arrived back with me the other day. thank you for all the totem paraphernalia too. Yeah, the drawings were so beautiful. I photographed as many as I could, but 5 days and thousands of kids means I didn’t get them all.